It was the worst of times, it was the best of times. In other words it was remodel time. "Having a remodeling deadline finally forced us to confront our clutter demons," says Tana Fletcher, a Maryland-based writer. When she and her husband decided to transform their basement into a combination workout room and writing studio a few years ago, they dreaded the daunting task of dealing with over two decades' worth of accumulated "stuff." But in the two-month period before the remodel officially started, the couple managed to sort, weed, donate, sell or discard what Fletcher describes as "our former life." "It was akin to excavating an archaeological dig," she recalls. "We uncovered layers of abandoned projects and outgrown interests and memories we'd rather forget." Although the preparation – or excavation – was a painful process, Fletcher claims her only regret is not having scheduled the remodel sooner. "That basement felt like a depressing dungeon for too many years," she says. "After we got it cleared out and fixed up, it became our favorite part of the house." 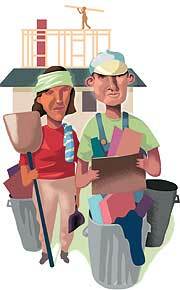 Yes, preparing for a remodel can be an ideal opportunity to lighten your load and "un-stuff" your life. Of course, if you have any pack rat tendencies at all, this can be a major challenge – but it's nothing compared to living with the actual day-in, day-out chaos of the remodeling process. So if you're planning any type of home remodel, it's never too soon to get advice from experts who know which pitfalls can be avoided – and which ones can only be predicted and endured. Sharon Kristensen, owner of Organization Plus in Menlo Park, has helped many clients survive – and even thrive – during their remodels. Some of these projects took several years to complete. But "doing a remodel successfully is no different than doing any other project successfully," says Kristensen, who is a project manager expert. "The same key steps are involved: planning and follow-through. And 90 percent of a successful project is about the planning." Clear communication is crucial. "If you can't clearly communicate your needs, expectations, schedule, and timing requirements, you're going to have problems," she observes. "And it will cost you. You can end up paying a lot of extra money in change orders." To help keep a lid on potential chaos while the remodel is under way, Kristensen recommends a daily meeting with the contractor or crew foreman first thing every morning. (Late sleepers take heed: Most construction crews like to start as early as possible – 7 a.m. is typical.) "You have to stay on top of it all the time," she says. "Use your project plan and time line to help you structure a daily checklist for the meetings." While project management software may be helpful, she emphasizes that "it won't do the work for you. You still have to sit down and think everything through." Figuring out your needs and how to solve them is half the battle. For example, if your remodel involves plumbing, will you have access to a working bathroom? If it's a kitchen remodel, will you have access to kitchen facilities? Don't wait until demolition day to figure out how you'll manage. Like Kristensen, Del Mar-based kitchen designer and Life Coach Lesa Heebner believes clear communication is a step toward the successful outcome of any remodel. "But keeping the end result in mind is equally important," she adds. Heebner, who has been involved in hundreds of kitchen remodels – including her own – also notes that problems often result from a lack of awareness on the part of the homeowner who is naive about how disruptive a kitchen remodel will be. "When you can't use your kitchen, your life can get pretty chaotic – unless you've prepared yourself," Heebner says. "Ingredients are the material components – in this case, that would mean identifying which appliances and supplies you'll need to set up and stock a temporary kitchen," Heebner explains. "Keep in mind the probable lack of a kitchen sink, which creates the major challenge. Stock up on disposable plates, bowls, cups, paper towels, napkins and utensils to minimize having to wash anything." Meal preparation at home during a remodel tends to be limited to breakfast and lunch, Heebner says. (Dinner is often too much of a challenge in a makeshift kitchen.) You should plan on having dinner out most nights, or bringing in takeout meals. Think about where you feel "most at home away from home" for dinner, she suggests. You might want to compile a file of menus from your favorite nearby eateries. "Also, rethink your breakfast – it affects your whole day," Heebner advises. (This also may be true for midnight snacks: Foraging for food amid the remodeling rubble is not recommended, even if you're wide awake.) If your typical breakfast would be too awkward to prepare and/or clean up without a stove or sink, figure out healthy alternatives that will work for your household. Another type of preparation for this kind of remodel involves clearing out your kitchen – don't even consider leaving anything in drawers or cabinets, let alone out on counters. Heebner suggests packing it all in categories. "Preparing for a remodel is a great time for organizing and paring down," she says. "You're going to have everything fresh and new – why not carry that theme forward to your kitchen tools and equipment?" She recommends purging anything that either doesn't work or doesn't work well. "And check your lids. If you have pots or containers that are missing them, or vice versa, this is a great opportunity to toss." Remodeling veteran Paula Jhung, who calls herself "the anti-cleaning guru," is the author of "How to Avoid Housework" (Fireside, 1995) and the "I Survived Remodeling" series. Jhung's recollections of her own remodeling experiences revolve around the overall lack of privacy inherent to the process. "You are never alone," she recalls ruefully. "It's no longer your home. You're living with all these characters who look at you sometimes as if you shouldn't be there." Jhung is bluntly pragmatic about the inevitability of dust. "Trying to dust during a remodel is like shoveling in a snowstorm," she says. "Learn to embrace dust, otherwise you'll go nuts." If you have dust allergies, obviously you'll need to make special arrangements. Fortunately, she believes in a theory explained to her by her contractor: "He told me, 'Construction dust is clean dust,' which made sense to me – at the time, anyway," she says with a laugh. However, she notes, be aware that remodeling tends to stir up bugs. Also, since your doors will probably be open a good part of the time, keep a lookout for vermin or rodents, which can become unwanted houseguests. But Jhung, who also authored "Guests Without Grief" (Fireside, 1997), claims you can actually use construction chaos to your advantage. "It can be a great time for entertaining," she says, somehow managing to keep a straight face. "Throw a construction theme party during the remodel – then you don't have to clean before or after!" More practically, Jhung suggests having your home professionally cleaned from top to bottom as soon as the remodel is finished. "Don't try to do it yourself," she cautions. "For one thing, it will kill your vacuum cleaner." Hire professionals who know how to clean every nook and cranny. Your heating/air-system vents should be cleaned professionally too, she advises; there are companies which specialize in doing that. Jhung points out that even though you may need to budget for these costs (some contractors do include cleaning costs in their bid), it's well worth it. "To finally walk in and see clean windows" – she sighs at the memory. "It's so uplifting to have it done – and done right – before you start putting back all your stuff." Harriet Schechter has helped thousands of people conquer chaos and clutter since 1986, when she founded the Miracle Worker Organizing Service in San Diego. She is the author of three books, including "Let Go of Clutter" (McGraw-Hill, 2001). Her online advice column can be found at www.MiracleOrganizing.com.